Our first stop on this swelteringly hot Tennessee day was Graceland, Elvis’ mansion where he lived and died. Having seen the tiny shack that he was born and grew up in just yesterday, walking around Graceland was awe-inspiring. It’s no secret that his lifestyle was lavish and over the top, and Graceland is a paradigm of the wealth and extravagance with which he lived his life. It made him feel more human and less godly to walk in his footsteps and to visit the place he died and was buried. Despite all his flaws, Elvis was an American hero, a self made man who rose to the top by way of talent and risk-taking. 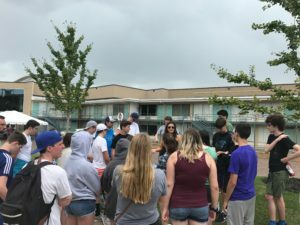 Then after free time on Beale street for lunch (some legendary bbq ribs- counselor Ben says he has been changed forever) we headed over to the National Civil Rights Museum at the Lorraine Motel, the site of Dr. Martin Luther King’s assassination. 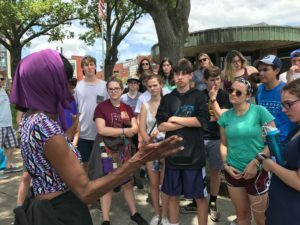 We took in the history and power of seeing the exact spot where James Earl Ray killed one of the most influential activists ever before meeting Jacqueline Smith, a protester of the museum itself. She argues that the creation of the museum resulted in gentrification of the area and displacement of poorer members of the community. 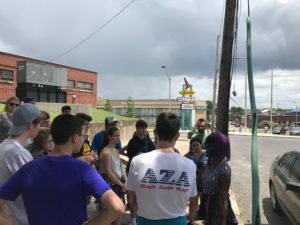 Our group was genuinely split, Smith’s words were controversial and many of us left conflicted- the museum was meant to honor Dr.King’s memory, but would he have rather kept the area the way it was and not have displaced the residents? We loaded back onto the bus and set out for Arkansas and Central High School. 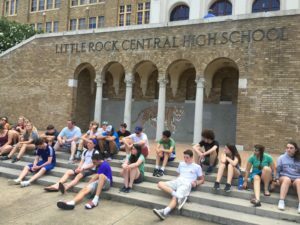 We first had a discussion about state vs federal government and then were led to the campus and walked up the steps that the Little Rock Nine had, officially integrating one of the largest and highest academically ranked schools in the nation at the time. Being in the exact spot was a powerful experience, it was like in a movie when the present fades out and you can see history being made. Your average history class becomes so much more visual and tangible when you can stand where they stood. At night, after pizza and swimming, we had a discussion where we reviewed background of the abortion debate, since we will meet with Pro Life Dallas tomorrow. It was refreshing to have quality conversation with educated and passionate peers. 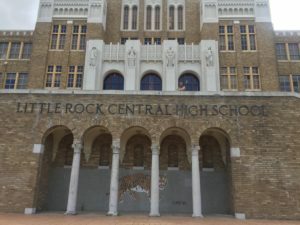 We closed our night with a visit to THE little rock, the namesake of the town. Honestly, it was a perfect experience to end my favorite day so far.